The games with the 'UNOFFICAL' tag on the Google Play icon are source ports of the original game. This means the only the game engine is included with the app, the game data files are not provided. The copyright of the data files belongs to the original IP holders and it would illegal for us to provide you these files. Therefore with these games it is required that you already own the full game for the PC, otherwise you will not be able to play the full version of the game. It is very clearly marked in the description if this is the case. If you have already purchased the app from Google Play and you were not aware you needed the data files, please send a message to support@beloko.com and we will refund the order in full. Please note, it is impossible to do refunds from comments in Google Play! Go to Google Play and download the app. Please note the paid app's are licensed to your Google Account, they must be installed on a device which has the Google account you used to purchased active. It can be run on any number of devices, as long as it is using your Google account. The first thing to try is the "Demo" button, this will download the Demo version of the game in order for you to test if the app is installed correctly and everything is working. After you have downloaded the Demo, press the Demo button again to play. If the Demo does not play please contact support. Copying the game data to your device. As mentioned in previously you must already own, or you must purchase the PC version of the game. Almost every game can be purchased from Steam, this is the easiest and quickest way to purchase the full game. Alternatively if you own the game on CD, or it is insalled on your PC you can use the files from there. 1. Install the game to your PC using Steam. You should be able to play the game on your PC at this point. 4. Connect your device to your PC and ensure you can see the device's files in Windows Explorer. At the top level of the file tree the 'Beloko' folder should have been created. 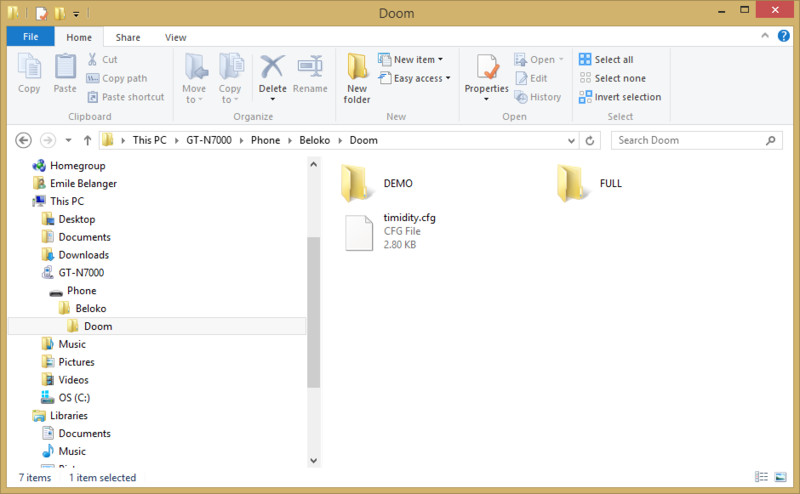 Navigate to the folder which was displayed in the app in step 3.The picture below shows Doom as an example. 5. Now copy the files from the Steam folder to the device. 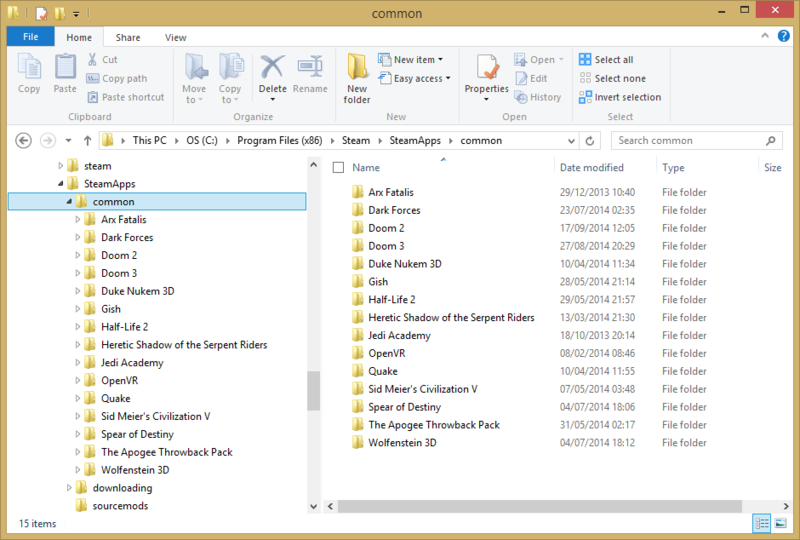 Note the required files may be inside another folder in the Steam folder, for example they are in 'base' in the Wolfenstine 3D folder. Now go back to the game on the device and press the 'Full' button. If it complains about missing files it means you have not copied over the files to the corect location, OR you have changed the 'Beloko Base Path' to point to an incorrect location. 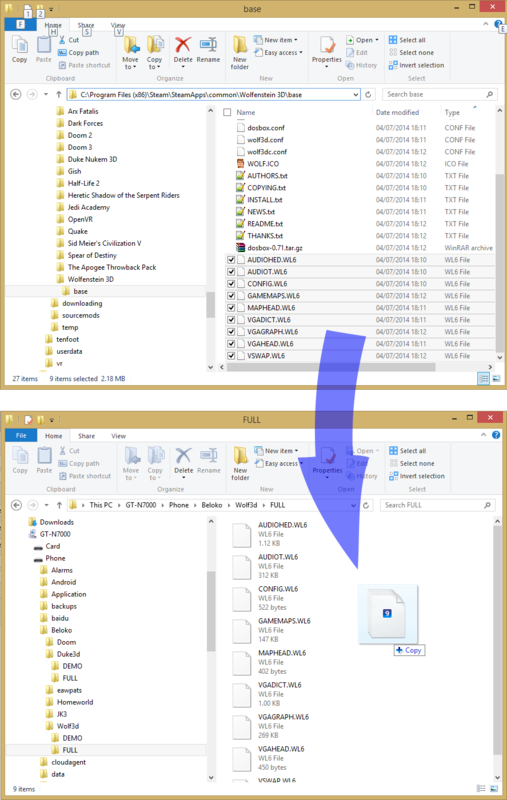 Remeber the 'Beloko Base Path' does NOT point directly to the game folder, it should look something like: "/sdcard/Beloko" NOT "/scard/Beloko/Doom/"